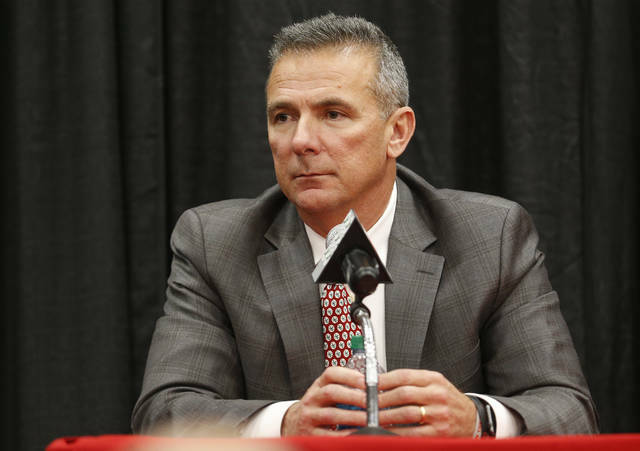 COLUMBUS — Urban Meyer’s decision to retire on Tuesday as Ohio State’s football coach was a little like a recruit waiting until signing day to make his choice. He’d thought about it for a long time but it wasn’t until the last few hours before he needed to make that decision that he knew for sure what he was going to do. Meyer’s future had been the subject of much speculation this season, mainly because of health problems. There was so much discussion about his health that he even called a small group of reporters into his office to discuss a cyst on his brain that causes severe headaches. At that time and several other times Meyer said he planned to coach next season. A report last week quoted an unnamed source who said he would coach the 2019 season, then retire and OSU offensive coordinator Ryan Day would take over. The answer about his future came Tuesday morning when Ohio State announced that the 54-year-old Meyer was retiring after the Rose Bowl and Day would be given a five-year contract to replace him. Meyer said he first began thinking seriously about making this his last season at Ohio State as he walked off the field after the Buckeyes’ 62—39 win over Michigan. “Going to Indianapolis (to the Big Ten championship game), it started to cross my mind. But I wanted to go longer,” he said. Meyer retired with a 186-32 career record at Ohio State, Florida, Utah and Bowling Green. He resigned for health reasons at Florida in 2009 but changed his mind a day later. He coached the Gators in 2010 and resigned again after that season. He worked as a television analyst in 2011 before returning to coaching at Ohio State. This time, he does not expect to return. “I believe I will not coach again. I’m certain,” he said. Meyer and Ohio State athletic director Gene Smith had been having discussions about his long-term future since last summer. Meyer had surgery for an arachnoid cyst in 2014 but problems related to the cyst returned. He dropped to his knees during the Indiana game earlier this season because of the pain and revealed he’d had a bad episode during last year’s Penn State game. “We came through it (the surgery) pretty good. In 2015 it was relatively good, 2016 was OK, 2017 was a tough one,” he said. Meyer took over at Ohio State after the Buckeyes went 6-7 in the 2011 season after Jim Tressel was forced to resign for not reporting NCAA violations to his bosses and the NCAA. Meyer had already won two national championships at Florida, so OSU knew it was getting a coach who could restore the program to the level it was accustomed to. What it didn’t know was how fast he would do that and how he would take it to even greater heights. Ohio State was 12-0 in Meyer’s first season. It has won 85 of the 94 games during his seven seasons, beat Michigan seven consecutive times and won the 2014 national championship. In addition to his health problems, Meyer became entangled in controversy this summer over claims he did not act quickly enough or forcefully enough about allegations of domestic abuse by former receivers coach Zach Smith, a grandson of his mentor Earle Bruce. He acknowledged the stress connected to that situation and a three-game suspension might have played a role in his decision. “There are cumulative reasons we’re at this point,” Meyer said. He said he is sure the controversy will affect his legacy in some people’s minds. “I haven’t really thought that through. That was a disappointing time. I can lie to you and say it (his legacy) is not important to me. Any human being, that’s important to you. And people will have their opinions,” he said. Smith remembered hiring Meyer in 2011 as “a time filled with promise” and saluted what he accomplished at OSU. “We knew we were getting an elite coach. When he went 12-0 in the first season we realized Urban was really going to be a game changer. What Urban has brought to Buckeye Nation by far exceeded expectations. Not only has he elevated the quality and status of our program, but his presence has elevated Big Ten football,” he said. Meyer said he wants to continue to work at Ohio State in some role but no specifics have been discussed.